"Terry is providing strategies to move the kingdom forward when the majority seem content passing judgement between generations. 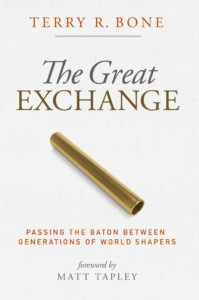 The Great Exchange comes at a crucial time for a church filled with leaders unsure how to properly enable the next generation to RUN." “The season is NOW for this book. This message is profound and must get ‘out there'!" "‘when differing generations meet in the ‘exchange zone’ of life, destinies converge and dreams are fulfilled"